Moderate frost damage can cause white speckling on pods, but pods remain intact and pliable and seed remains green and turgid. Watch closely but the best move may be to let this crop mature further before swathing. This was taken 4 hours after a minus 7°C frost. Green pods are already turning white and popping open. Don’t make a snap decision. Before taking any action, wait at least 4-6 hours after temperatures come back above 0°C to allow the full extent of frost damage to become evident. The crop may look undamaged that morning but by the afternoon wilting, desiccation and pod splitting may begin. This crop may need to be swathed to preserve yield. Elevated green counts are likely. Default to waiting. Consider swathing after a frost only if a lot of the pods are damaged and shelling and pod drop could be high in the coming days. In this situation, putting crop into a swath may protect it somewhat from pod drop and shatter losses, but any yield potential from immature seed is likely lost. Crop stage. Crop at 5% seed colour change on the main stem is really green. More time standing will only benefit this crop – unless frost has basically killed it. In that situation, swathing might be the better option but neither is good. Yield will be very low as most seeds will shrivel up and not contribute to yield. Canola at 30% seed colour change on the main stem is on the early side for yield potential, but after a pod-damaging frost, this may be worth swathing. If most or all seed is mature and you planned to swath the day after a frost anyway, then don’t bother waiting 4-6 hours. Just start swathing. Frost severity. Temperature is not always a good indicator of frost damage. Some crops seem to make it through fairly low temperatures in decent shape while others can have surprisingly high amounts of damage from a light frost. Look for damage the first day after a frost. 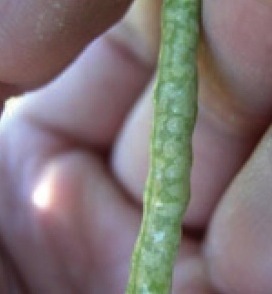 Frost-spots on pods might be just superficial and this crop will benefit from more time standing. Even if a few pods seem to be popping open, if most pods are OK, more time for these pods to mature will likely provide more than enough yield and quality benefit to offset any potential losses from shattering pods. If no damage is evident after the first day and you decide to leave the crop, scout again after 2 to 3 days to reassess. 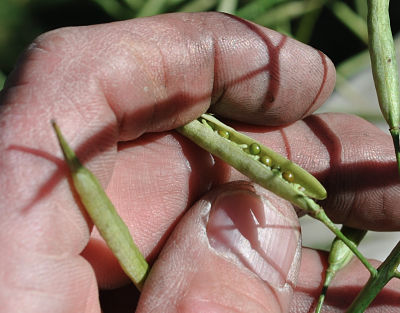 If by then pods are severely damaged and have begun to desiccate, swath during periods of dew or high humidity to reduce the amount of pod shelling and pod drop. Percent of pods damaged. If only the very top pods are frost damaged, it may be unwise to cut early as these may not contribute much to overall yield anyways. If frost damage was minimal to the lower pods that will contribute more to yield, waiting will help them. If most pods are severely damaged and are beginning to desiccate, swath during periods of dew or high humidity to reduce the amount of pod shelling and pod drop. Forecast and calendar. If good harvest days are coming (or likely to come at some point) and the frost risk for the immediate future is reduced, consider leaving mildly frost-damaged canola standing. Each additional day standing should benefit this crop. Research conducted by the Canola Council of Canada over approximately 28 site-years indicates that swathing at 60% SCC resulted in 8% more yield (which was equivalent to about 3 bu./ac.) than at 30-40% SCC, 12% more yield than at 10-20% SCC, and 19% more yield than swathing before 10% SCC. Many nights of frost. After several nights of frost, canola with a high percentage of green immature seed might not have much chance to mature further. Look for pod and pedicel cracking. If frost damage is evident, swathing may protect these pods from further wind loss. Logistics and timing. Those with a lot of canola to swath may need all the swathing days they can get. That may mean some canola will have to be swathed on the early side. Fields at 30% SCC that have frost damage could be swathed in this situation. Crop standing for straight combining. Frost can actually be a benefit as it provides some extra dry-down of green stems. Frost at the point when pods are brittle and quite dried down will likely have little or no impact on the seed, and pod-shatter tolerance can also help maintain pod integrity if the crop wasn’t quite that dry yet. Scenario 1. If 50% of the field has moderate to severe damage, there’s a risk that hardest hit plants will begin to shell out and any seed that can contribute to yield will be lost. However, the yield and quality of the seed in this part of the field has likely already been significantly reduced. If the remaining 50% of the field has light to minimal damage, swathing too early may further reduce yield and grade. Leaving the field standing and following it to the proper stage for swathing can allow the remaining intact seed to clear green and continue filling, improving both grade and yield. This part of the field will likely contribute most to yield anyway, and anything severely damaged will likely shell out or be separated with the chaff or dockage. Scenario 2. When the field is more than 50-60% severely damaged, the crop will shell so it is best to swath to protect any viable seeds. Quality is likely to be poor anyway, so it is more important to protect as much yield as possible. Scenario 3. If a field has light to moderate damage in portions or across the field, the best decision is probably to wait and swath when seeds in side branches are firm to roll. Any seeds that are damaged will be shriveled and will typically blow out of the combine with the chaff or end up as dockage. Areas of moderate damage should be monitored regularly for pods becoming desiccated and prone to shattering. If this occurs, consider swathing either the whole field or just the affected areas, if that is practical.